The New World Order has been destroying people for a very long time as they create situations that tear society and families apart. It is all a shell game, a distraction fashioned after the Hegelian Dialectic to further erode liberty regardless of what country you reside in. Open your eyes and watch what the New World Order controlled governments that create the problems in the first place do next to bring about a solution they say ensures that it “never happens again”. Drones, phones, loans and zones! NEVER GIVE UP YOUR GUNS! What happens when self defence is against the law? Satan Prince Of This World by William Carr - pdf document - This is a must read. It is a clear presentation of the New World Order and Illuminati. Surprisingly Carr pinpointed the conspiracy 50 years ago. Pages 32 to 35, describe the template used by the globalists and why our current world is as it is right now. Governments, as we have been lead to believe, do not exist. It is a ruse. There is Corporations that pretend to be governments. What we have been taught by the systems of the world and the various medias is not reality. To name a few, (there are too many to mention): Martin Luther King, JR. , Mohandas Karamchand Gandhi, John Lennon, Rosa Parks, Mother Theresa, Helen Keller, Petra Kelly, Joan Baez, were all used by the New World Order as catalysts for social change. These individuals helped usher in the New World Order agenda. It is all by design. The New World Order has been in the making for a long time, its pieces fit into place from divergent realms with many different leaders & participants. Their agenda is a diabolical program through which patient, slow implementation is draining the spiritual, moral, economic and political life of the worlds population. The New World Order elite in every country have joined together and they have conspired against the rest of the world. If people think that this conflict is about COUNTRIES, they are wrong. The world leaders who are sold out to Satan are all on the same team. Let's begin by looking at some of the realities and evidence of these realities. Russia is the puppet of the USA govt. Does the puppet do anything on it's own, without the puppet master having a hand in it? The USA has supported Russia since the USA overthrew Russia in 1917. Japan tried to surrender before the USA dropped nuclear bombs on Hiroshima and Nagasaki. The USA President who murdered hundreds of thousands of innocent Japanese civilians after Japan tried to surrender was: 33rd degree Freemason Harry S Truman. Truman was not afraid of Russia. Truman and Stalin were both 33rd degree Freemasons. Quotes from Illuminists the 1st quotes were made by Stalin. Webmaster's note: We do not endorse the teachings of SFAWBN OR 'PASTOR' PETERS... but we do give him credit for this interview with Michael Hoffman. The word slave comes from "slav." This is not a race issue, it is a class/dumbed-down Satanic government owned education issue. USA brought Nazi scientists into the USA after World War 2. They dominated NASA and created the whole FAKE moon landing nonsense. We have the "former" Nazi Air Force with their own training center in the USA. The USA has military bases in at least 139 countries. The USA is building a One World Military for these Biblical endtimes. General Wesley Clark, Supreme Allied Commander of NATO, Europe. There is so much that can be said about this man, but I suggest that readers pay attention to this article http://en.wikipedia.org/wiki/Wesley_Clark. Take special notice at the bottom of the very 1st paragraph where it mentions knighthood. That is code for being a member of a secret society(s) and also swearing allegiance to the Queen of England. Follow this simple progression of thought to see for yourselves what is true in this world today. 3. The Pope claimed ownership of the entire world on May 4, 1493. Pope Alexander VI issued The Bull Inter Caetera which can be read here: http://www.catholic-forum.com/saints/pope0214a.htm. Search that page for the word "hence" and begin reading if you don't want to read the whole page. February 8, 2012 — Americans pay a percentage of their taxes to the Queen of England via the IRS. The IRS is not an agency of the Federal Government. It is an agency of the International Monetary Fund which is an agency of the United Nations. No law has ever been passed legalizing the charging of income tax. The 1040 tax form is the payment of a foreign tax to the King/Queen of England. American citizens have been in financial servitude to the British Monarch since the Treaty of 1783 and the War of Dependence. All tax payers have an Individual Master File and are held liable for a tax via a treaty between the US and the UK and payable to the UK Prior to 1991, the Business Master File in 6209 was US-UK. Tax Claims, non-refile DLN. That means that everyone is considered a business and involved in commerce . . .
Our own money is being used for loans, even to our own country, which we have to pay back with interest to the International Monetary Fund. What portion of our national debt does this account for? Americans pay a percentage of their taxes to the Queen of England via the IRS. The IRS is not an agency of the Federal Government. It is an agency of the International Monetary Fund which is an agency of the United Nations. No law has ever been passed legalizing the charging of income tax. The 1040 tax form is the payment of a foreign tax to the King/Queen of England. American citizens have been in financial servitude to the British Monarch since the Treaty of 1783 and the War of Dependence. Note that the military generals in the Pentagon were confused about these USA military attacks on the countries mentioned in Wesley Clark's video, but they still did obeyed the orders. THE GENERALS OBEYED SATANIC ORDERS TO ATTACK OTHER NATIONS WITHOUT CAUSE!!! Thesis - USA gov't calling Iran "evil" and promoting the New World Order. Antithesis - Iran gov't calling USA a "bully" and calling for a New World Order. The leaders of both countries are on the same Satanic team. They merely present the illusion that they are leaders of opposing forces. They are both part of the New World Order plan. 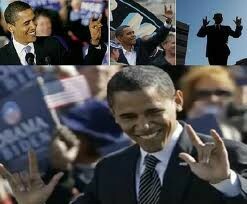 Notice the Satanic hand signs used by both leaders in the pictures below. 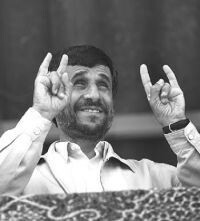 The Satanic hand signs are non-verbal communication signifying their allegiance to the New World Order. The evidence is all around us. The USA government is the 2nd beast of Revelation 13 and it is nearly ready to dominate the entire world for the antichrist. The two verses above the video are what the lying preachers and priests quote to sell the New World Order to their "church" members while telling them to submit to every evil that government wants to do. The USA govt is intentionally terrorizing the public. Psalm 94:16: Who will rise up for me against the evildoers? or who will stand up for me against the workers of iniquity? The videos below are available on our Video Streaming & Download Page. Click on the title link and a new page will open to the Streaming video, after the video loads, it will stream so you can view it.